What does Bali conjure up for you? I visualised tropical forests full of exotic flowers and monkeys, rice paddies richly green in the sunlight, temples full of strange images and wooden pavilions adorned with comfortable day beds overlooking inviting swimming pools where I would be waited on by my own personal Ketut. Could I make my vision a reality? Kenn and I had only five days at our disposal. I contacted my niece, Amanda Sullivan who runs a wonderful travel agency in Cowra. Within an hour of my call, Amanda and her team at Dynamic Travel www.dynamictravel.com.au had us sorted. Flights, transfers, an exceptional hotel and very helpful notes on how to stay out of trouble were ours! We flew with Garuda. To my surprise, it was an extremely comfortable flight. The in-flight entertainment, food and beverage were excellent. The portent of things to come, I wondered? Arrival was easy. My baggage wasn’t searched, no-one looked at me twice and I didn’t get lost in customs. 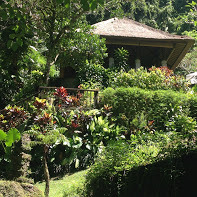 Before I knew it, Kenn and I found ourselves ensconced in a very comfortable car with a friendly driver winding our way through the hills to Ubud. Our hotel, the Maya Resort and Spa was simply lovely. Our room was very spacious and the bathroom was to die for. There was a lovely outlook from the balcony over the acres and acres of gardens. Then there were the facilities! Both of us fell in love with the amazing lower pool which overlooked the jungle and the river. We swam leisurely up and down ( I didn’t want to splash other patrons with my attempts at butterfly or backstroke) and relaxed on our sun lounges while the helpful staff brought us drinks and little healthy treats to eat. There was also a lovely yoga studio. It’s always good to have a beautiful view to look at whilst attempting mountain pose. I enjoyed Happy Hour and diligently worked my way through a slab of the cocktail menu. The restaurant was exactly what you imagine a Balinese restaurant should be. Every table overlooked a courtyard with its own pool and frangipani tree. The staff were unfailingly helpful and kind. It goes without saying that the food was fantastic. 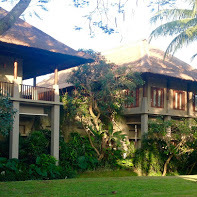 It was hard to leave the resort for the delights of Ubud. Especially memorable was breakfast. There were special treats like fresh papaya juice, interesting traditional vegetable and fruit porridges and an omelette man. You know it’s good when you can feel the kilos piling on but you can’t restrain. Then there was the Spa! This was an afternoon of total indulgence. I was ushered to my private pavilion and greeted by my therapist. 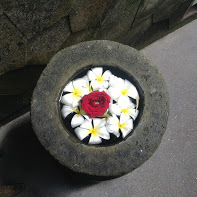 My treatment began with a relaxing foot treatment and was followed by a Balinese massage. Every part of me seemed to be floating away. Next came body exfoliation. Stuff ( I’m not sure what – I was too far gone to remember) was rubbed onto me, allowed to dry then brushed off. Then a yogurty cream was slathered on and allowed to sink in. Just as I was almost asleep, my therapist ushered me to my private courtyard shower. There among the flowers, under the sky, I rinsed off before luxuriating in a huge copper flower bath which overlooked the river. Three hours later, I returned to Kenn and the real world. An experience not to be missed! We did leave the resort to explore this part of Bali. We hired a guide who put an itinerary together for us. He took us to a Balinese Dance performance, Batik making, silversmithing, a traditional Balinese home and a temple celebration where we had to don sarongs and make offerings. It was busy, fascinating and humbling. 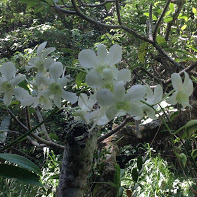 We also went to the Kintamani volcano which is amazingly beautiful, visited a plantation and saw Luwak coffee being made. I felt sorry for the civets and couldn’t bring myself to taste the coffee. As far as I’m concerned, poo is poo. 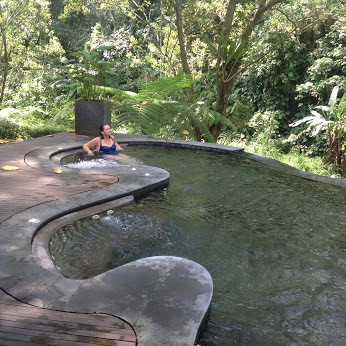 We wandered on foot around Ubud, but really only touched the surface. We found the Balinese people gentle, unassuming and unfailingly kind. They take pleasure in the simple things in life symbolised by the offerings they make every day to the gods. Thank you Amanda for making this such a wonderful trip.